Available with multiple spot color imprints or backgrounds. Quality handsewn 13 month, two color calendar pad. • Available with multiple spot color imprints or background. • All Kwik-Stik© Calendars have safe, removable adhesive backs for easy replacement each year. • 13 months of exquisite Textured Vinyl exposure. • Quality Hand Sewn, 13-month, Two Color Calendar Pad. • The advertiser’s own special shape available within the size limitations of 2-1/4" x 1-5/8" by adding $175.00(x) to the first order only. 250 qty. = 6 lbs. / 1,000 qty. = 24 lbs. 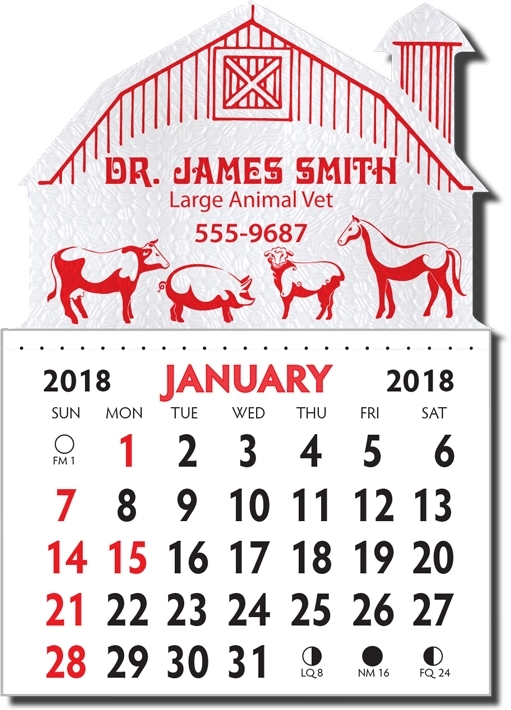 • Priced each in one color on white background with Barn shape. • Production time is Seasonal. Contact us for current production time & schedule. • SHIPPING: starts in August...specific ship dates will be accommodated whenever possible at no charge. Must be ordered in increments of 250. All prices and policies subject to change. Copyright © 2019 Lewis Promotional Marketing - All rights reserved.